Oxalis, sometimes known as Yellow Woodsorrel. Bright yellow flower, most often a summer annual (prolific right now). 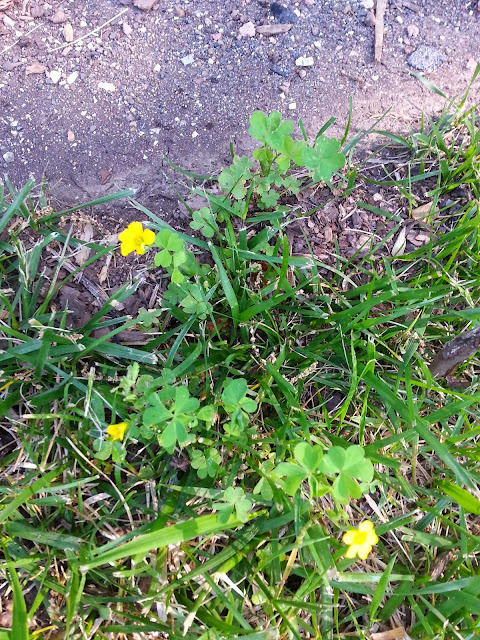 Sneaky little weed that tends to deflect weed control when applied as blanket spray with high water rate! Easy to kill with spot spray low water volume direct hit, especially with a little "Splat" sticker thrown in. Battleship Herbicide. will hammer it! Irrigation 101: How to properly water your lawn. Most people with irrigation systems do not understand the best way to program and manage their irrigation system. The tips I offer here will help you figure out how to set your irrigation system, regardless of the irrigation system you own. Turf-grass uses the most water during times of high heat and low humidity. This tends to be during late April, early May, and from August through October. Turf-grass uses water to cool itself very similarly to how a car uses a water pump. Water is pulled in through the roots and exits through the leaves. When the humidity is below 70%, water is rapidly pulled throughout the plant and into the atmosphere. If enough water is available, the grass will stay green and healthy. If you heave a week with no rain, temperatures in the upper 70s to upper 80s and humidity below 70%, your lawn will use almost 1.5 inches of water. These weeks are rare, but do occur during the months listed above. When temperatures are high and the humidity is high, your lawn will use only about 1 inch of water per week. When humidity levels are high, the turf-grass cannot pump the water effectively because the atmosphere is already moist. This is typically when you start to see fungus develop. My best yards water each zone just two days a week. They apply half an inch to each zone twice weekly. In order to figure out how much water each irrigation zone is putting out, place coffee cups or tuna cans in the lawn; make sure these are flat on the bottom with vertical sides. Let the system run however long you have the system currently set. Stick a ruler in the can to determine the amount of water you are applying for the amount of time you have each station set. Adjust the time as necessary to catch half an inch each time the system runs. Set your irrigation system to water twice weekly during most of the year. During the time of the year when humidity drops, you may have to add the third day of water to keep the lawn properly watered. We use irrigation to supplement rainfall. When nature provides a heavy rain, the water seeps through the profile and the grass responds. The roots of the turf-grass grow downward towards the seeping water. Therefore, the roots grow deep and strong. People, who water for a few minutes, several times a week, encourage the roots to stay near the surface because the roots get frequent light water on a consistent basis. When the average temperatures climb into the 90s for a few days, weaker grass wilts quickly. When the grass wilts or dies, weeds take its place. The second reason for watering deeply and infrequently is as follows. Light, frequent, watering keep the soil surface tamp. This encourages weeds like nutsedge, crabgrass, johnsongrass, and dallisgrass to grow. The turf-grass gets ZERO benefit from a wet soil surface. Weeds however, love a wet soil surface. We want to encourage the turf-grass while discouraging weeds. Changing your irrigation to water deeply and infrequently will reduce weed germination by 90%. Please try to adjust your system to more closely resemble the deep and infrequent system. If you have a large system with many zones, you may need to water half of your zones one night and the other half of the zones the next night in order to run each zone long enough to apply one half of an inch per watering. What time should I water my lawn? The best time to water your lawn is from midnight to 7:00 am. The wives tale of “watering at night causes fungus” is just that, a wives tale. Dew forms on turf-grass each night and keeps the leaves wet until the sun dries them the next morning. Turf-grass also excretes guttation water during the night. Guttation water is high in sugars and excellent for feeding fungus spores. Therefore, irrigation at night washes off gutattion water, which is a GOOD thing. Turf-grass fungus occurs more when the DURATION of leaf wetness increases than when the total amount increases. Water left on the leaf blades when soil temperatures are high is like adding gasoline to a fire for fungus. Therefore, we need to stop watering by 7:00 am, so that the grass blades will be dry by the same time they would if it were only dew on the leaf blades. High air temperature + high leaf moisture=fungus development! How can I tell if my lawn is getting enough water? Take a Phillips head screwdriver and stick it in the ground. You should be able to push the screwdriver in the ground and touch the handle of the screwdriver soil (as far as it will go). If you can, and the screwdriver does not come out of the ground muddy, your soil is perfect. If the screwdriver slides in the ground very easily and comes out muddy, reduce the duration time of watering. If you have a hard time and have to stand on the screwdriver to make the handle touch the soil, increase the duration of watering! Please call me with any questions about your irrigation habits. With your help, we can give you the healthy, weed free turf you are looking for! Without your help, we can’t make your lawn the best it can be! 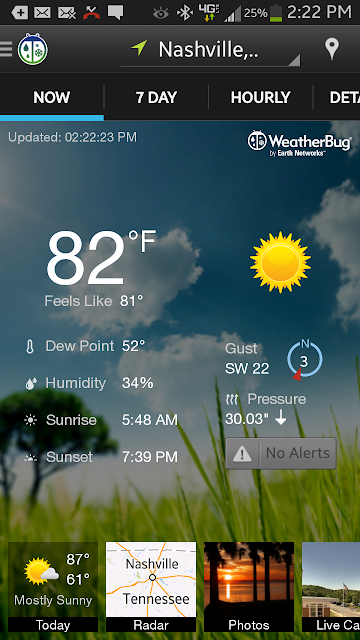 The temperature is in the mid 80's, the humidity is low, plus the wind speed is high. Therefore turn up your water! We are losing(fescue is using) about 1/3 inch per day. minutes twice weekly, so the majority of your water goes through soil profile and into turf roots, instead of dampening soil surface for nutsedge to germinate and having more of your water evaporate from wind/heat than be used for the plants!